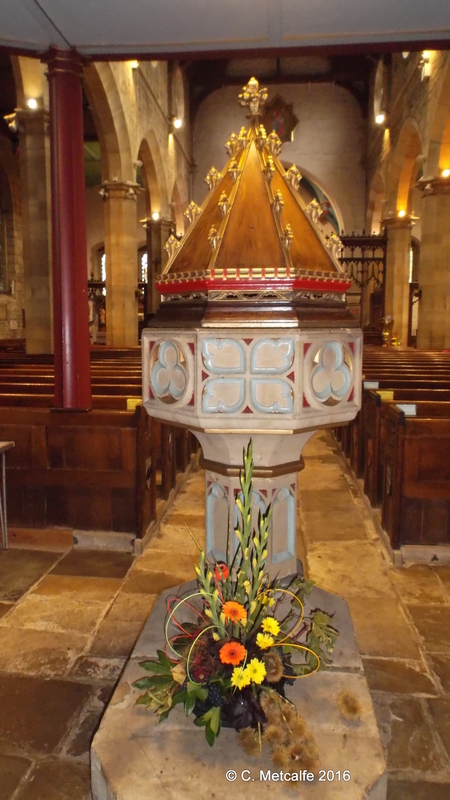 The Font, used for baptism, in St Swithun’s church is a large stone construction situated just inside the inner West Door. 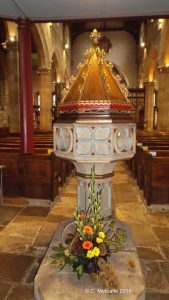 Several of the Church Guide books use the word ‘conspicuous’ to describe this font- you can’t miss it because of where it stands. This position is traditional. In Medieval and Tudor times, it was believed that babies should be baptised very soon after their birth, to give the child, reborn in Christ through Baptism, a chance to enter Heaven if the child died- as many did. Usually the mothers were still undergoing the ritual of confinement and, following childbirth, were too weak to attend the christening. The font is symbolic of the rebirth of a child through the sacrament of Baptism. The font also faces the east end of the church and the High Altar, where another sacrament, Holy Communion, is administered. This particular font was apparently replaced on an older pedestal in 1926. The octagonal panels were sculpted according to the designs of a Mrs Penny and a Mr A.E. Martin. The oak cover, which is extremely heavy, was bought by parishioners through a subscription, in memory of the Rev’d D. Blakiston, in 1928. Blakiston was Vicar of St Swithun’s from 1871 to 1908. The Rev’d Douglas Yeoman Blakiston was born in 1832 and died in 1914. He trained as an artist but turned to the church, and came to the vicarage in 1871. He was married to Sophia Matilda, nee Dent and they had 6 children. Writing about the eldest son, Herbert, biographer Clare Hopkins commented that in this household there was ‘an atmosphere of impoverished respectability’. Three of the boys died in sudden and early deaths. Between 1910 and 1914, the parents and their 2 daughters died, leaving only their eldest child, Herbert Edward Douglas Blakiston, born in 1862. He lived until 1942. The Vicarage fire in 1908 caused great distress to the Rev’d Blakiston and he retired soon afterwards. The Vicarage was destroyed and he lost many possessions, as well as incurring financial costs, because it was under insured. This font has great significance in terms of Christian symbolism. Its base is very old, and the octagonal panels are nearly 90 years old. The cover is a reminder of a very long-serving Vicar, who suffered much personal sadness. Thousands of babies must have been baptised at this font, or at a font on this site, over hundreds of years.